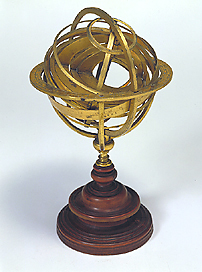 This armillary sphere is gilded and mounted on a turned wooden base. It is signed by Girolamo della Volpaia, son of Camillo and the last representative of the family of craftsmen who were of such importance in the Grand Duchy of Tuscany during the 16th century. The sphere is dated 1557, but does not derive from the Medicean collection. It was acquired in the second half of the nineteenth century by the Florentine Museum of Antique Instruments, as the Lorraine Museum of Physics was called at the time.